Hundreds of Scouts from across Poole gathered on Poole Quay yesterday, Sunday 26th April, in order to celebrate St. George’s day. The parade started opposite the RNLI Station heading down the quay, finishing outside the Thistle Hotel, with families and friends of the young people on parade lining the streets in support. 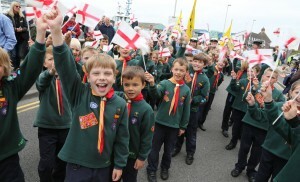 The weather held out for the duration of the parade and it concluded with all Beavers, Cubs, Scouts, Explorers and Leaders renewing their promises. The Mayor of Poole, Councillor Peter Adams, also attended the celebration of St. George and said how fantastic it was to see so many young people in attendance. He also commented on amount of time volunteered by Adults in Poole to keep Scouting active in the town and how much it benefits the wider community. St. George was adopted as the Patron Saint of Scouting by founder Lord Baden-Powell, who also has a statue on Poole Quay. He was chosen as the Patron Saint due to overcoming adversity when he famously faced the dragon.